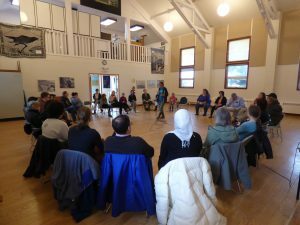 Community in Unity went off the road system in April for a conversation about immigration and community building in Unalaska/Dutch Harbor. Nearly half the residents of the small Aleutian fishing town are immigrants. Community members and students came together for two different events to talk about how immigration has shaped Unalaska, what makes it such an accepting place to live, and how that could change because of national rhetoric and shifting immigration policy. Community in Unity – Unalaska is a co-production of Alaska Public Media and Unalaska Community Broadcasting.